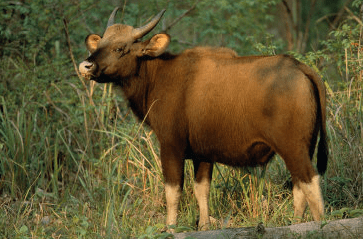 Indira Gandhi (Anamalai) National Park complete detail – updated. Geography of Indira Gandhi (Anamalai) National Park. Dominant flora and fauna of Indira Gandhi (Anamalai) National Park. How to Reach Indira Gandhi (Anamalai) National Park. The ever-changing topography of this park consist dry scrub forests, savannah forests, moist deciduous and evergreen forests and grasslands at high elevations. The park is rich in mixed deciduous forest with fair population of rosewood and teaks. The forests are noted for their valuable timber trees including teak and rosewood, Hopea parviflora, Mesua ferrea, Calophyllum…………..
Total area of the Park is 117.10 Km2. 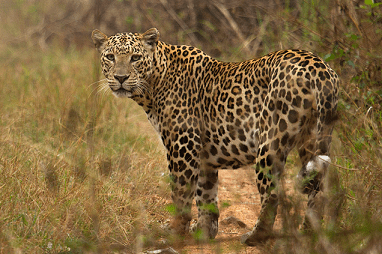 The area 117.10 Km2 of Indira Gandhi Wildlife Sanctuary was declared as a National Park in the year of 1989. The park is rich in mixed deciduous forest with with fair population of rosewood and teaks. The Orang National park is the home to a wide variety of floral and faunal species. 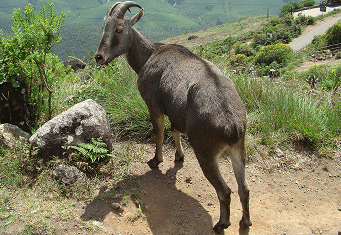 The faunal species includes Nilgiri Langur, Giant Squirrel, Lion tailed macaque, Gaur, Elephant, Chital, Sambar, Mouse Deer, Barking Deer, Variety of Birds, Tiger, panther, Wild Dog, Nilgiri Tahr, Nilgiri Langur, Bonnet macaque etc. The bird life includes Malabar whistling thrush, Grey jungle fowl, Malabar and Great pied hornbills, Ceylon frogmouth, Malabar trogon, Red Tree Pie, Whiskered Bulbul, Spotted Dove, Black Headed Oriole, Pigeons etc. The Amaravati reservoir in the park, having a large number of crocodiles…………. Indira Gandhi (Anamalai) National Park is a beautiful place, located in the Coimbatore district of the state of Tamil Nadu. Indira Gandhi (Anamalai) National Park is a part of Indira Gandhi (Anamalai) Wildlife Sanctuary. Anamalai derives its name (‘Anai’ meaning elephant and ‘Malai’ meaning hills) from the large number of wild elephants living in the area. Anamalai Wildlife Sanctuary was established in the year of 1976. The Anamalai Wildlife Sanctuary was renamed as Indira Gandhi Wildlife Sanctuary in the year of 1987 (After former Indian Prime Minister Indira Gandhi who visited the Sanctuary). Total area of the Sanctuary is 841.49 Km2. The area 117.10 Km2 of Indira Gandhi Wildlife Sanctuary was declared as a National Park in the year of 1989. The Steering Committee of Project Tiger granted approval in principle to inclusion of Indira Gandhi WLS and NP under Project Tiger in 2005. 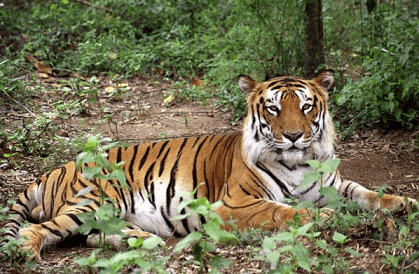 Indira Gandhi Wildlife Sanctuary was declared a Project Tiger sanctuary in 2008. Continuance of Project Tiger’ in Anamalai Tiger Reserve for FY 2010/11, at the cost of Rs. 23547,000, was approved by the National Tiger Conservation Authority on 31 August 2010. There are many places of natural and scenic beauty in the Anamalai national park. Some of them are Grass hills, Karianshola, Anaikunthi Shola, groves, waterfalls, teak forests, reservoirs and dams. The Orang National park is the home to a wide variety of floral and faunal species. 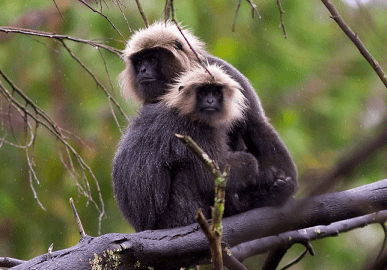 The faunal species includes Nilgiri Langur, Giant Squirrel, Lion tailed macaque, Gaur, Elephant, Chital, Sambar, Mouse Deer, Barking Deer, Variety of Birds, Tiger, panther, Wild Dog, Nilgiri Tahr, Nilgiri Langur, Bonnet macaque etc. The bird life includes Malabar whistling thrush, Grey jungle fowl, Malabar and Great pied hornbills, Ceylon frogmouth, Malabar trogon, Red Tree Pie, Whiskered Bulbul, Spotted Dove, Black Headed Oriole, Pigeons etc. The Amaravati reservoir in the park, having a large number of crocodiles. The ever-changing topography of this park consist dry scrub forests, savannah forests, moist deciduous and evergreen forests and grasslands at high elevations. The park is rich in mixed deciduous forest with fair population of rosewood and teaks. The forests are noted for their valuable timber trees including teak and rosewood, Hopea parviflora, Mesua ferrea, Calophyllum tomentosum, Vateria indica, Cullenia excels and Mangifera indica. 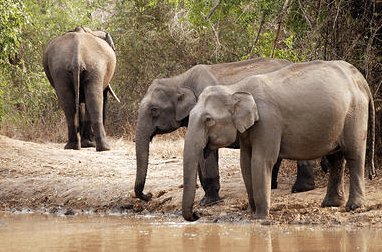 Indira Gandhi Wildlife Sanctuary and National Park, Eravikulam National Park, Chinnar Wildlife Sanctuary and Parambikulam Wildlife Sanctuary all which are a part of the Anamalai Hills are well known for elephants. The hills is a part of the Western Ghat ranges. It is also a popular destination for temples and Anamalai Temple is one among them. This is also a place for many Hindu and Jain temples. It is also known as one of the eight sanctified Jaina hills. Anamalai Hills is the ideal place for first-time trekking. There are several points that have been set here and trekkers undertake their journeys to these points. Elephants were earlier trained and used at Anamalai for timber operations till felling of trees was stopped in 1972. The elephant camp has become a popular public attraction since 1976. There are 20 Kumki elephants at the Kozhikamudhi Elephant Camp in the IGWSNP. There are 13 tuskers (including three calves) and seven cow elephants. In 1997, annual celebration of Elephant Pongal at Top Slip was begun. For Pongal, several decorated elephants stand in front of the Pongal pot to mark the commencement of the celebration. In 2011, Elephant Pongal was celebrated on 18 January. On 24 February 2011 the Kumki Karthik was gored to death by two wild male elephants after it unchained itself in the camp and escaped into the forest. The elephant was in must and was in search of a female companion. By the mid-1800s, large tracts of Valparai plateau in the Anamalai were under intense tea or coffee plantations after deforestation of the natural forests. In 1855, this area came under sustainable forest management for teak plantations by the pioneering efforts Douglas Hamilton and Dr. H. F. Cleghorn of the new Tamil Nadu Forest Department. In the early 1900s, protection of the Karian Sholas was also ensured. History of the National Park is closely linked to a very nature loving British Officer named Hugo Woods. The region had Teak plantations in plenty, and heavy deforestation of its forests severely damaged its ecological balance. Real efforts to regenerate the forests began with the coming of British forester Hugo Woods to the place in the year 1915. 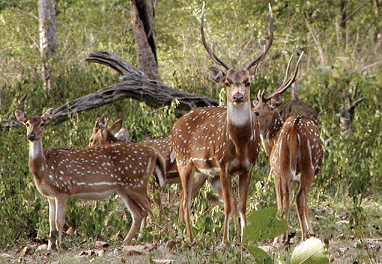 Anamalai Wildlife Sanctuary was established in the year of 1976. Anamalai derives its name (‘Anai’ meaning elephant and ‘Malai’ meaning hills) from the large number of wild elephants living in the area. The Anamalai Wildlife Sanctuary was renamed as Indira Gandhi Wildlife Sanctuary in the year of 1987 (After former Indian Prime Minister Indira Gandhi who visited the Sanctuary). Total area of the Sanctuary is 841.49 Km2. Indira Gandhi (Anamalai) National Park situated in the Anamalai Hills of the Western Ghats, part of the erstwhile Coimbatore South Forest Division in Coimbatore District of the state of Tamil Nadu. The topography affects the rainfall pattern over the Park giving rise to diverse habitats ranging from dry scrub and savannah forests, moist deciduous and wet evergreen forests, to high elevation grassland interspersed with sholas. A source of several rivers and many large dams, Anamalai boasts Sholyar dam, one of the biggest in Asia and Parambikulam dam one of the largest water carrying capacity in India. The forest cover is very dense and it is very thrilling and exciting to be exploring these dark dense forests. The jungles in Indira Gandhi Sanctuary are thick and wooded with the flora to back up the fabulous fauna. There are evergreen forests in Indira Gandhi National Park, which are moist and deciduous forests and the lagoons and estuaries, sheltering unique forms of plant and animal life. The dry deciduous, the semi-evergreen, and the wet temperate habitat of this park contain teak, rose wood and many miscellaneous tropical species. The temperature varies from a high of 35°C in the lower altitudes, in summer to a low of 0°C in the higher elevations during winter. The floral diversity has been estimated to be over 2000 species, of which about 400 species are of medicinal importance. The Karian Shola NP has been identified and designated as a Medicinal Plant Conservation Area (MPCA) due to its medicinal plant diversity. Apart from its rich tree diversity, over 100 species of orchids, a wide variety of ferns, grasses, palms and canes abode here. Teak, Bamboo, Reeds, Hopea parviflora, Mesua ferrea, Calophyllum tomentosum, Vateria indica, Cullenia excelsa, Mangifera indica, Machilus macrantha, Alstonia scholaris, Evodia meliaefolia, Ailanthus, Eucalyptus grandis, Podocarpus wallichianus etc. 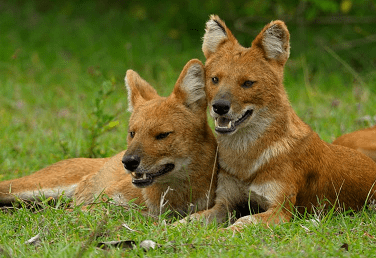 Mammals – Tiger, Panther, Asiatic Wild Elephants, Gaur, Sloth Bear, Spotted Deer, Wild Bear, Porcupine, Wild Dog, Flying Squirrel, Jackal, Civet Cat, Pangolin, Sambar, Muntjac, Giant Squirrel, Common Langur, The Nilgiri Langur, The Bonnet, Nilgiri Tahr, Stripped-necked mongoose, Common Otter, Smooth Indian Otter, Nilgiri marten, Black naped Indian Hare, Bandicoot Rat, Grey musk shrew etc. Birds – Rocket-tailed Drongo, Red Tree Pie, Whiskered Bulbul, Spotted Dove, Black Headed Oriole, Pigeon, Grey Jungle Fowl, Malabar Whistling Thrush, Great Pied Hornbill, Malabar Hornbill, Mountain Imperial Pigeon, Black Eagle, Crested Goshawk, Rufous bellied Eagle, Jerdon’s Baza, Mountain Hawk Eagle, Peregrine Falcon, Owl. Grey Jungle fowl, Painted Bush quail, Ceylon Frogmouth, Peregrine Falcon, Painted Bush Quail, White-bellied Woodpecker, Nilgiri Wood Pigeon, Dollar Bird, Asian Fairy Bluebird, Wynad Laughing Thrush Parakeets, Babblers, Drongos, White-bellied Shortwing, Hill Myna, Nilgiri Flycatcher etc. Reptiles – king cobra, krait, python, Vine snake, Crocodiles, Grass snake, tortoises etc. The best time of the year to visit the Indira Gandhi (Anamalai) National Park is between the months of December to April. By Air – Nearest airport is Coimbatore airport, about 80 Km from the Indira Gandhi (Anamalai) National Park. Coimbatore airport is well connected by road network to Indira Gandhi (Anamalai) National Park. By Rail – Nearest railway station is Pollachi railway station, about 35 Km from the Indira Gandhi (Anamalai) National Park. Pollachi railway station is well connected by road network to Indira Gandhi (Anamalai) National Park. By Road – Indira Gandhi (Anamalai) National Park is well connected to Major Cities and Places by road network. There are a number of government and privately operated vehicles that go to Indira Gandhi (Anamalai) National Park at frequent intervals. Accommodation available at Forest Rest Houses and dormitories for visitors. There are cottages and group accommodation facilities available at Topslip to suit different budgets. Visitors are normally taken by Forest Department bus for a drive through the forest roads. The bus also stops at one of the Elephants camps – Kozzikamithi, where one can go for a short elephant ride and watch domestic elephants being bathed and fed. Other National Parks in Tamil Nadu. Name of National Parks, Year of Notification and Total Area is as follows……….